Mutations of the Adenomatous polyposis coli (APC) gene associated with the developement of colorectal tumors are common in the modern population, but because lifestyle and environmental factors like obesity, physical inactivity and chemical exposure prevalent today contribute to cancer rates, human remains from earlier times in history provide a unique insight into the evolution of disease. With soft tissue diseases like colorectal cancer, it’s difficult to find evidence in remains most of which are skeletal. Mummies can bridge the gap, especially natural mummies with surviving tissue that was not embalmed. The mummies of more than 265 people buried in the crypt of the Church of the Whites in Vác, Hungary, between 1731 and 1838 have already proven a boon to medical research. The crypt was bricked in decades ago and forgotten until it was rediscovered by construction workers in 1994. The steady, cool temperature, continual low-level ventilation and the anti-microbial and moisture-absorbing properties of the pine shavings in the coffins created a perfect storm of preservation. There’s also extensive surviving archival information about the people buried in the crypt, which gives researchers valuable information about familial relations, professions, age, dates, etc. 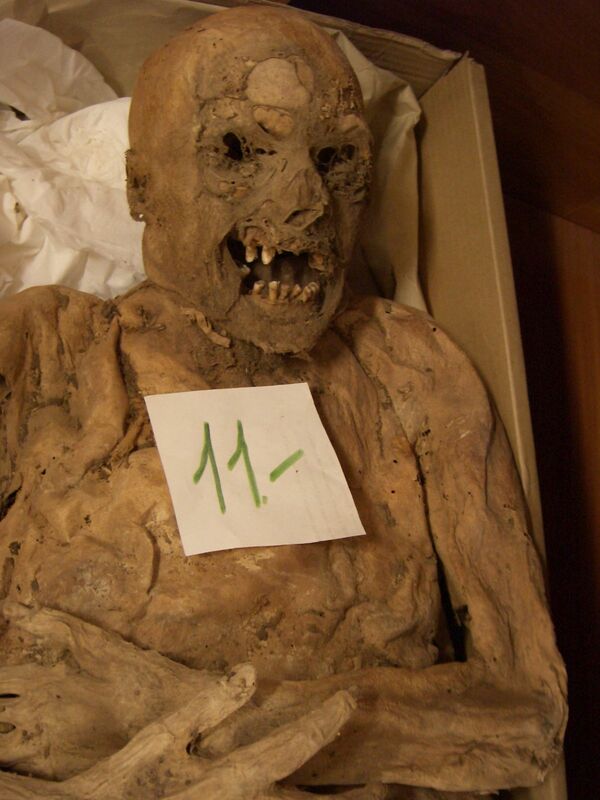 Last year a study found 12 different strains of tuberculosis in DNA extracted from the Vác mummies. Now a new study has found a genetic predisposition to colorectal cancer in one of the mummies. The discovery of the gene doesn’t mean the individual ever had colon cancer, of course. While very well preserved, the sample was still desiccated and, well, mummified, so researchers weren’t able to distinguish tumors from normal colon tissue. This is an important breakthrough in the analysis of ancient DNA and the study of the evolution of disease. Until now, ancient DNA studies have primarily focused on extracting the DNA of pathogens. This is the first published study to report the presence of cancer or mutations association with cancer in the DNA. Research on ancient cancer has had to make do with bone lesions and microscopic evidence. The study has been published in the journal PLoS ONE and can be read free of charge here. The Denver Art Museum has returned a statue looted from the archaeological site of Koh Ker to Cambodia. The Torso of Rama was one of many sculptures from the Prasat Chen temple looted by the Khmer Rouge during the Cambodian civil war in the early 1970s and sold through unscrupulous dealers to major museums and private collections in the US. The Denver Art Museum acquired it in 1986 from the Doris Weiner Gallery in New York and had it on display until last December. I apologize for the tiny pictures (you know this hurts me more than it hurts you), but this repatriation is such momentous news I couldn’t not post about it. 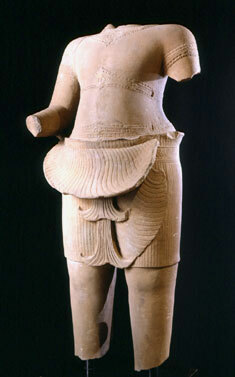 The Torso of Rama was the last Prasat Chen statue in a US museum. The Metropolitan Museum of Art returned the Kneeling Attendants in May of 2013. Sotheby’s returned the statue of warrior Duryodhana in December 2013. The Norton Simon Museum in Pasadena returned Duryodhana’s enemy Bhima in 2014. At the same time, Christie’s bought back a statue of Balarama it had sold twice, once in 2,000, once in 2009, specifically to return it to Cambodia. 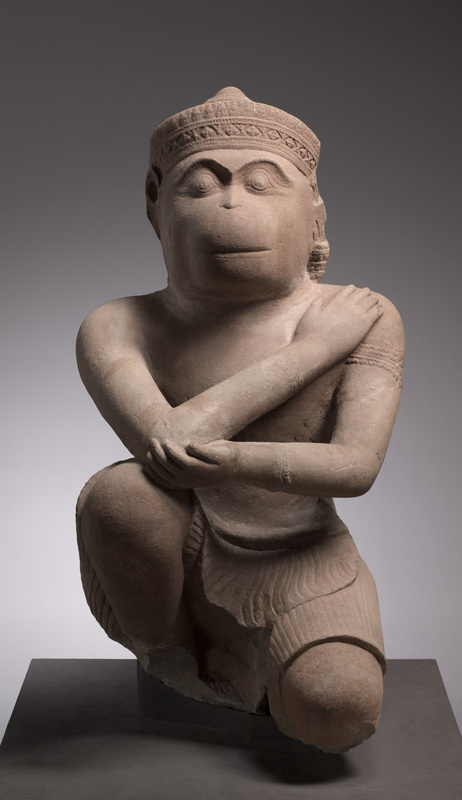 Last year the Cleveland Museum returned a statue of the monkey god Hanuman. Now the Denver Art Museum, the last public holdout, has finally caved. American museums are officially no longer in the business of taking advantage of the Khmer Rouge’s brutalizing of the 10th century capital of the Khmer Empire. That leaves only three or four statues missing from Koh Ker (exact numbers are hard to pin down). We don’t know where they are because they are almost certainly in private collections. Unfortunately that means they can remain hidden indefinitely as long as sales are arranged privately rather than through auctions or in some other manner that attracts publicity. Given what two major international auction houses and four US museums just went through, I doubt the holders of these stolen artifacts will do anything that draws attention to their loot. Anne Lemaistre, Unesco representative to Cambodia, reached out to those shadowy figures in the wake of Denver’s return of Rama. “To have all of the statues returned to Cambodia is something Unesco has been working hard to achieve, and we appeal to anyone who may currently have one of the remaining statues in their private collection to follow the nice gesture of the Denver museum and return it,” she said. The return of Rama will give Cambodia the opportunity to reconstruct the figure grouping at the eastern gate of Prasat Chen. Rama and Hanuman are believed to have stood there, along with two other monkey deities locked in battle that are now in the National Museum of Cambodia. This New York Times graphic from 2013 explains where scholars believe the looted statues were originally located in the temple complex. All of the statues in that graphic are home now. 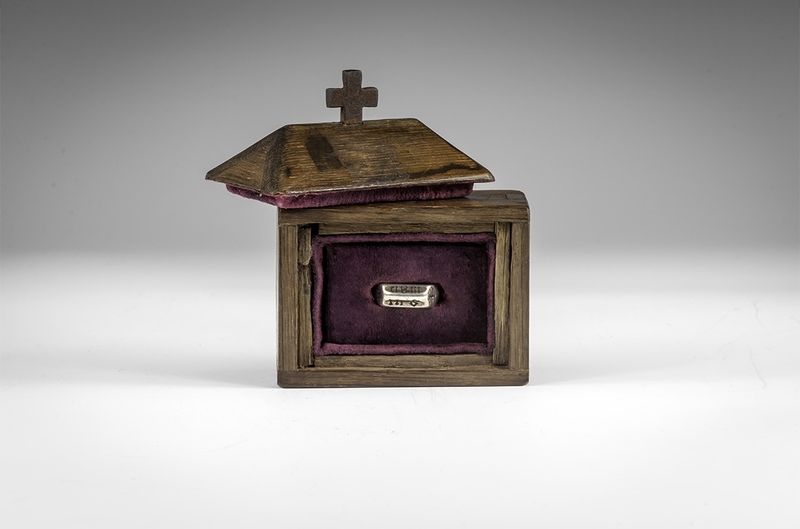 A ring that was ostensibly owned by Saint Joan of Arc sold on Friday at Timeline Auctions for £240,000 ($333,000), blowing through the presale estimate of £10,000-14,000 ($13,990-19,590). Including buyer’s premium the final cost was £297,600 ($412,845). According to Timeline spokesperson, “The ring is returning to France.” Some news reports assume the French government is the buyer, but the auction house was vague on the particulars so it could just as well be a private collector. The ring is silver-gilt inscribed with the letters “I” and “M” on the shoulders and “IHS” and “MAR” on the face. Those are abbreviations for Jesus and Mary. Along the shank are lozenges with very worn florals inside. It was made around 1400 and has an illustrious ownership history that can in theory be traced all the way back to the trial of Joan of Arc in 1431. After Joan’s arrest, her ring was taken by Bishop Pierre Cauchon, Bishop of Beauvais, chaplain to the Duke of Burgundy and ally of the English, who presided over her trial for heresy. According to the ownership history established by researchers in the 20th century, Cauchon gave the ring to Cardinal Henry Beaufort, Bishop of Winchester, who was present at the trial. It remained in his family, the Cavendish-Bentinck family (Dukes of Portland), for 500 years until the early 20th century when Lady Ottoline Morrell gave it to artist Augustus John a few years before 1914. It was through John that it first entered the auction market in 1914. The ring passed through several hands before physician James Hasson acquired it at a Sotheby’s auction in 1947 for the grand sum of £175. The current seller was Dr. Hasson’s son Robert Hasson. Asked if she herself did not have some rings, she replied to us, bishop: “You have one of mine; give it back to me.” She said the Burgundians have another ring; and she asked us, if we had her ring, to show it to her. Asked of what substance one of her rings was, on which the words Jhesus Maria were written, she answered that she did not properly know; and if it was of gold, it was not of fine gold; and she did not know whether it was of gold or brass; she thought there were three crosses, and to her knowledge no other signs save the words Jhesus Maria. Asked why she gladly looked at this ring when she was going to battle, she answered that it was out of pleasure, and in honor of her father and mother; and having her ring in her hand and on her finger she touched St. Catherine who appeared before her. According to the auction house and the documentation (all of which dates to the 20th century), the ring matches this description, but I think it’s a pretty huge fudge to say the ring has three crosses on it like Joan said it did. There are no crosses engraved on the ring. The lot description describes: “incised niello-filled florid lozenges and triangles, the design giving the appearance of three crosses.” I don’t really see Joan of Arc being so subtle as to describe crosses formed by negative space instead of just the plain fact of the lozenge decoration. 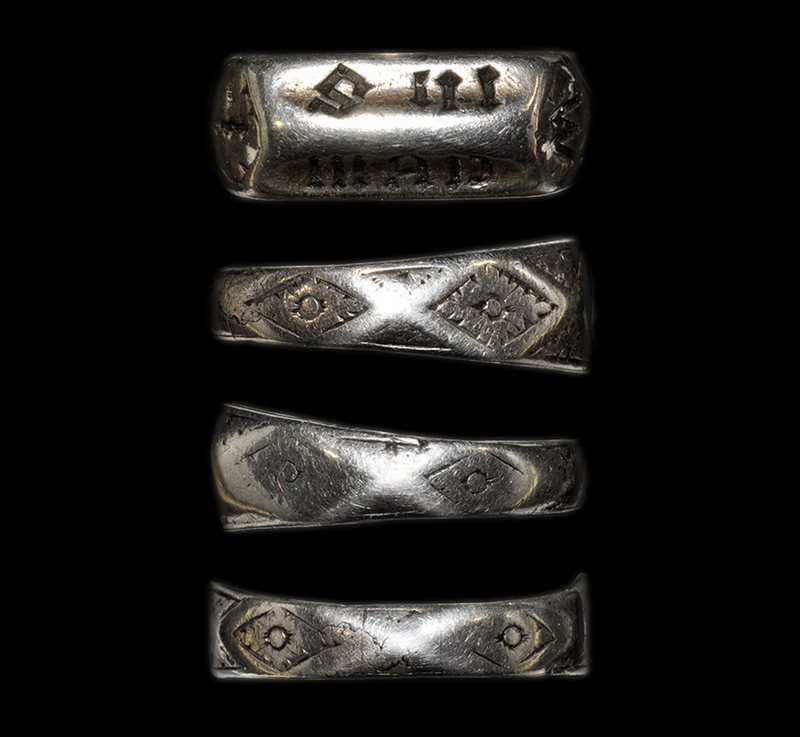 The wear, ring style and engraving are consistent with a 15th century date, so whoever dropped more than a quarter of a million dollars on the piece has a nifty medieval devotional ring to show for it, plus the Cavendish-Bentinck family lore, a hundred years of speculation and several museum exhibitions in France and England connecting it to Joan of Arc. Archaeologists excavating the Early Mesolithic site of Star Carr in Yorkshire have unearthed a shale pendant with engraved lines. This is the first pendant with an engraved design from this period found in Britain and it’s the only engraved pendant made of shale ever discovered in Europe. It was found in a sediment layer that was once shallow water about 30 feet from the shore of the paleo-Lake Flixton. The organic material in the sediment is still being dated, but preliminary estimates date the sediment deposit to around 11,000 years ago. When it was first discovered it just looked like a piece of stone. The hole that marks it as a pendant was clogged with sediment and the very faint engravings weren’t visible. It was only when it was lifted out of the ground that the sediment fell out of the perforation and the engravings were spotted. Just one side of the shale is engraved with very small lines at angles from each other of a kind defined by the first excavator of Star Carr and expert in Early Mesolithic art Grahame Clark as the barbed lines type C. They were incised on the stone. 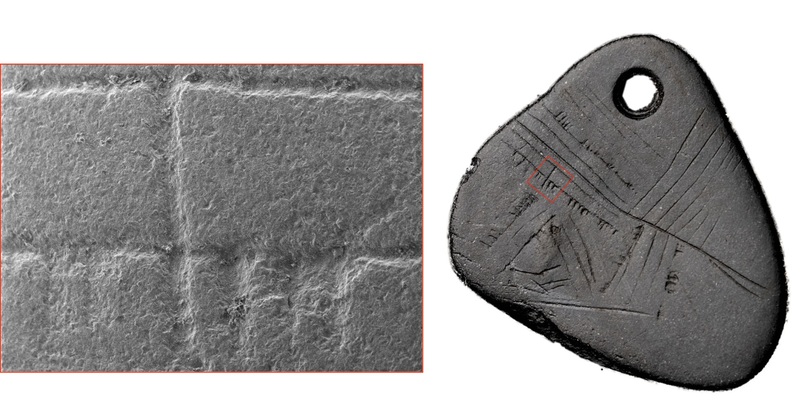 Incision was the most common method of Early Mesolithic engraving (as opposed to boring and drilling) and geometric designs engraved on portable objects were typical of the period in northern Europe. 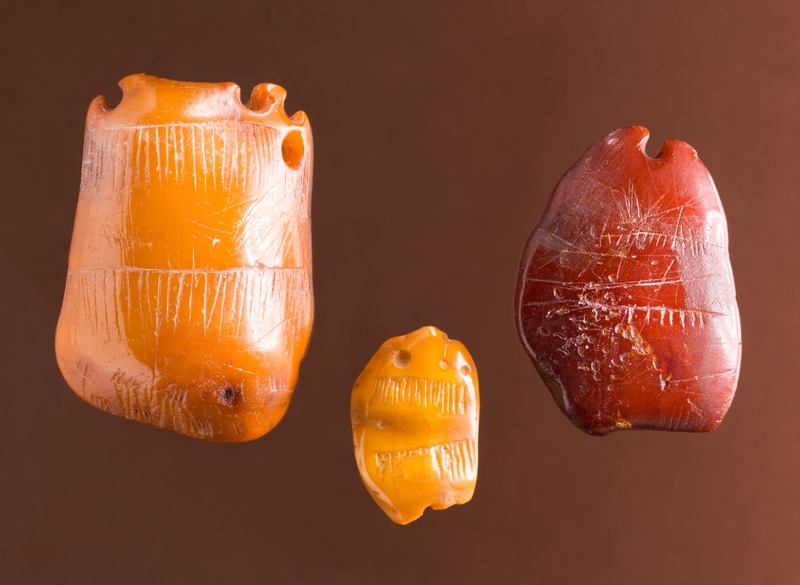 A perforated, engraved shale pendant is unique; the usual materials were amber, antler and bone. 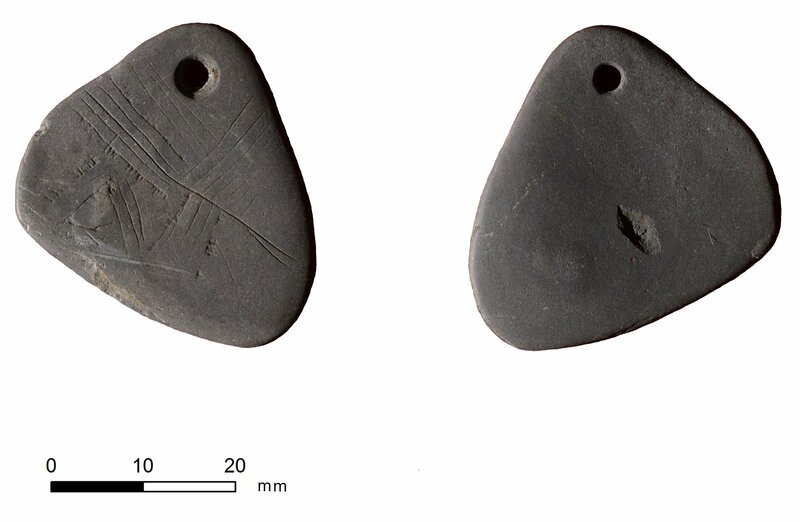 Grahame Clark’s Star Carr excavations in the 1950s and the current excavation, which began in 2013, recovered a number of unengraved shale beads, distinct from the pendant because the perforation is in the center rather than the top. The hole in the top suggests the object was suspended from a necklace. The team studied the engravings with integrated light microscopy, reflectance transformation imaging (RTI) and scanning electron microscopy (SEM). SEM and RTI proved particularly effective at identifying the order of engraving and showing the impressive precision with which these angled lines, some of which are teeny tiny, were inscribed. They found that the central groove was done before the lines parallel to it, then the tiny right angle lines, then the grooves perpendicular to the central one, the tiny lines connected to them and then the rest of the lines in the field. The groups of lines were engraved in at least two, possibly more, phases. The order of engraving is significant because it may be an important clue to the purpose of the lines. Modern ethnographic parallels suggest that the proper recording of kills and associated rituals would have been seen as essential to guaranteeing future hunting success. The deliberate faintness of the engravings may have been in order to ensure that the information on the pendant remained, in effect, a secret record of kills and related rituals that was accessible only to particular individuals or groups. Evidence of ritual activity at the site abounds. The most recent excavation has unearthed six ritual headdresses made from the skulls and antlers of red deer, and earlier excavations turned up 21 more of them. Given the rarity of the pendant and the great effort made to engrave it, it’s a strong possibility that it is related to the rituals practiced in prehistoric Star Carr. The pendant was 3D scanned so it could be virtually examined from all sides. You can explore it yourself with this 3D scan viewer. A most wonderful paper full of details about the find can be read in its entirety here. The English Reformation of the 16th century saw the widespread destruction of religious art associated with the Catholic Church. What the zealots of the Reformation missed the zealots of the English Civil War destroyed. An estimated 97% of the UK’s religious art was destroyed during the Reformation and Civil War. The few pre-Reformation church paintings that managed to survive are usually defaced or damaged. Conservators at Cambridge’s Hamilton Kerr Institute have discovered that a rare 15th century panel painting managed to survive the artmageddon in excellent condition because it was recycled during the Reformation. The Kiss of Judas is an oil on panel work painted in bright colors with silver and gold leaf details in around 1460. It captures Judas in the act of betrayal as Roman soldiers crowd the background and Peter draws his sword. Underneath is an inscription painted in gold letters: “Jhesu mercy and eue[r] mercy Ffor in thy mercy fully trust.” The subject matter makes its survival even more remarkable since images of Judas were often gouged or scratched by faithful Catholics as well. The painting was acquired by the University of Cambridge’s Fitzwilliam Museum in 2012. The seller was the Church of St. Mary the Virgin in Grafton Regis, Northamptonshire. Unable to afford to keep the delicate panel painting in proper conservation conditions, the church sold it, after getting permission from a special Faculty of the Diocese of Peterborough, to the museum. The proceeds of the sale were used to repair to the roof and other features of the 13th century Norman church. When the painting arrived at the Hamilton Kerr Institute, it was in bad condition. 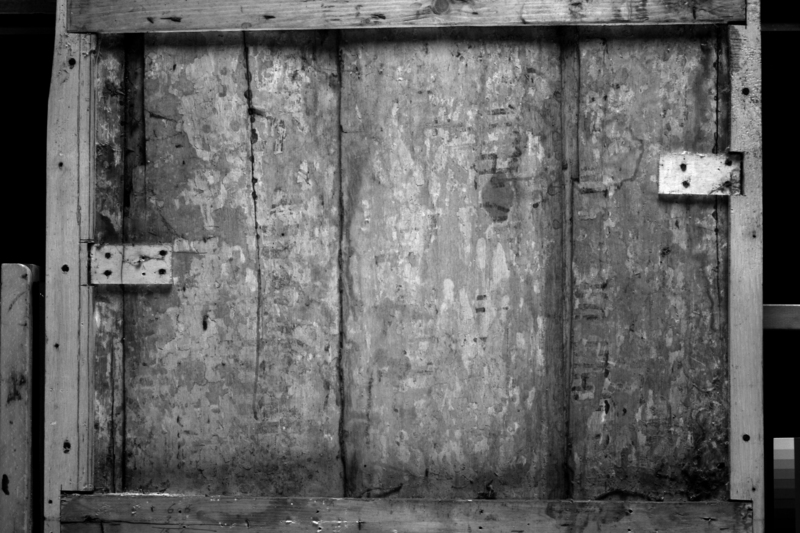 It was covered in dirt, darkened varnish and bat guano, so much so that the image was hard to discern. Conservators used X-ray imaging and examined it with infra-red and UV light to identify obscured details, the original pigments and which areas needed the most urgent attention. They cleaned the dirt and bat feces, removed the darkened varnish, treated the wood to keep insects from doing any more damage and applied a layer of protective varnish restoring the original vibrance of the paint and precious metals. It was the back of the painting that provided the clue to its history. It was covered with a plywood backing board that was removed for conservation. When examining the back of the boards that make up the panel, conservators found traces of what looked like lettering. Infra-red photography revealed that it was indeed lettering and from the 16th century. It seems the excessively Catholic painting was just turned around and the back used as a board for writing. The lettering isn’t legible, but experts think it may have been the Ten Commandments because they were commonly hung on the walls of Protestant churches. It could have just been a parsimonious choice, a practical way to reuse a painting that was no longer acceptable to the mores of the time. On the other hand, someone may have done this on purpose to keep the painting from almost certain destruction. We’ll never know. The history of The Kiss of Judas is vague. It wasn’t originally painted for St. Mary’s — it was first documented there in the early 1900s — and it may have been part of a larger piece like a rood screen. Dendrochronological analysis of the wood found that it came from a tree in the eastern Baltic that was cut down after 1423. It was painted in Britain between 1437 and 1469. One hint of its origins was a coat of arms discovered by infra-red photography hidden under the paint. The closest match to the coat of arms was traced to a branch of the Belgrave family in Leicestershire. The painting is now on display in the Rothschild Gallery of the Fitzwilliam Museum. The 12th century Bogolyubskaya Icon of Theotokos (Greek for the Mother of God), once deemed an unfixable “archaeological ruin,” has been restored not quite to its original splendor but to its original colors. This is a great achievement for a revered artwork that is one of only about 30 icons from the 12th century that still survive. An exhibition at the Grabar Art Conservation Centre in Moscow tells the tale of its checkered life, from miraculous conception to this latest restoration. The story begins in 1155 with Grand Prince Andrei Bogolyubsky (“Andrew the God-Loving”). He was traveling to the city of Vladimir, the new capital of the Vladimir-Suzdal Principality which arose from the demise of the Kievan Rus, a demise Andrei vigorously and successfully fought to accelerate. With him he carried a precious icon now known as the Miracle-Working Vladimir Icon of the Mother of God. The icon was Byzantine, made in Constantinople in 1131, but was believed to have been painted by Luke the Evangelist. It was also believed to have miraculous powers of protection, particularly in battle, which is why Andrei carried it with him. Seven miles outside of the city near the banks of the Klyazma River, Andrei’s horses suddenly refused to take another step. The prince prayed before the icon the whole night and received a vision of the Virgin Mary holding a scroll in her right hand. She commanded him to take the icon to Vladimir and build a church and cloister on the place where she had appeared to him. Andrei did what she told him to and more besides, commissioning a new icon commemorating his holy vision. The icon depicted Mary holding a scroll in her right hand, just as Andrei has seen, her left hand raised in prayer to Jesus shown as an adult in the upper right hand corner. As promised, Prince Andrei built his own palace and a church, the Nativity of the Blessed Virgin, on the site of his vision. The icon was installed in the Convent of the Nativity of the Blessed Virgin (later known as the Bogolyubsky Convent). When another church in Vladimir, the Dormition or Holy Assumption Cathedral, was completed, the icon was translated to it. Under Andrey Bogolyubsky, Vladimir grew into the dominant cultural, economic and political center of the region and remained so until 1237 when it was besieged by the Mongol Golden Horde commanded by its founder Batu Khan. It fell on February 8th, 1238, and never again regained the prosperity and power it had once enjoyed. Dozens of Vladimir’s characteristic white limestone churches and public buildings were burned, but the icon survived the Mongol onslaught. It nonetheless suffered many slings and arrows over the centuries. In 1722 the church building collapsed and the Bogolyubskaya Icon was trapped under the rubble for days. In 1771, Vladimir was struck by plague. The icon was paraded through the city and the epidemic miraculously ended. Every year after that the icon was brought to the city from May 21st until July 16th during which the miraculous procession was repeated in towns and villages all over the region. The annual parades almost destroyed the icon. Exposed to the elements, the centuries-old paint weakened and the wood panel deteriorated. After the revolution church art was nationalized by the Bolshevik government. A restoration commission headed by artist, art historian and founder of the conservation center that bears his name, Igor Grabar examined the icon. 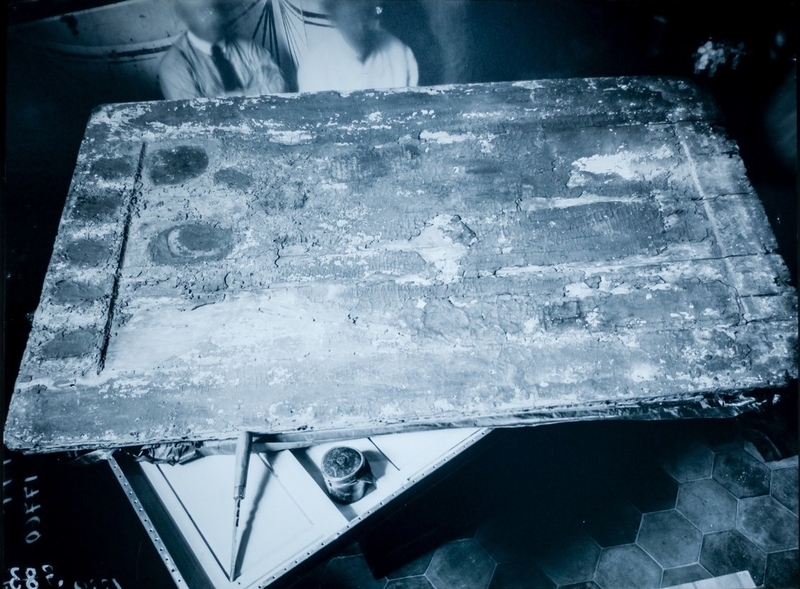 When they removed the metal casing, they were horrified to find the icon blackened, the paint crumbling, the gesso rotting, the panel bored with holes from wood worm and the surface crawling with live larvae. Dismayed restorer Alexander Anisimov called it an “archaeological ruin.” Thanks to Grabar’s judicious reluctance to interfere with what was left of the icon, a prescient approach that was not common then, the team documented it photographically, killed the pests and strengthened the board as best they could. Later restorers were not so circumspect. In a 1946 attempt to restore the icon, or at least prevent further deterioration, Vladimir museum restorer and artist F.A. 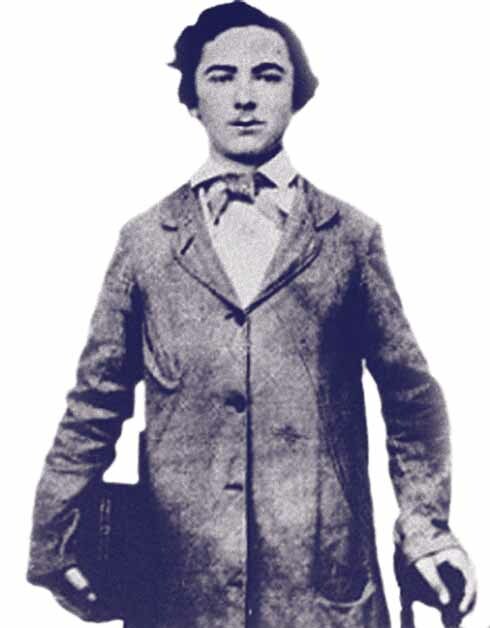 Modorov came up with the idea of covering the surface with hot paraffin wax. He thought this would strengthen and protect the flaking paint layer. Who could have predicted that pouring hot wax on a delicate, wood worm-tunneled, flaking, 700-year-old painting would be hugely destructive? (Anyone. Anyone could have predicted that.) Subsequent attempts at restoration were able to better reveal Mary’s face and some of her clothes. They could not repair the decay of the gesso layer and the paint, but the icon was stable and under the constant supervision of conservators. 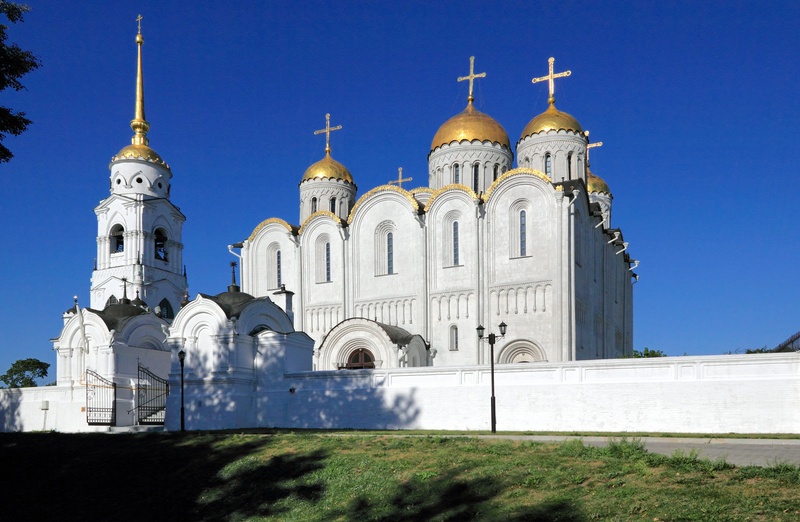 With the revival of the Russian Orthodox Church after the fall of the Soviet Union, the Cathedral of the Holy Assumption Convent in Vladimir claimed the icon. It was transferred to the convent in 1993 where it was put on display in a climate-controlled, hermetically sealed encasement made by the same outfit that made Lenin’s glass coffin. Lenin still looks great, but his encasement is constantly monitored and repaired. The icon received no such attention. Of the four batteries that powered the microclimate, only two of them worked and one of them had been sold by the nuns to raise money for the church, so really it was just a clear box with a lock. Meanwhile pilgrims left fresh flowers in vases of water at the feet of the icon, releasing humidity right into the box. On top of that, the original white limestone floor was replaced when a sponsor offered to install a new granite floor. Enter groundwater penetration, drainage problems, and perpetual damp. When one of the tiles was lifted later, mushrooms were growing underneath it. This disaster was discovered in 2009 when nuns reported there was some sort of fungus growing on the surface of the icon. The failure to properly care for one of the first icons ever painted in Russia and one of very few religious artifacts to survive the Mongol invasion caused a scandal. 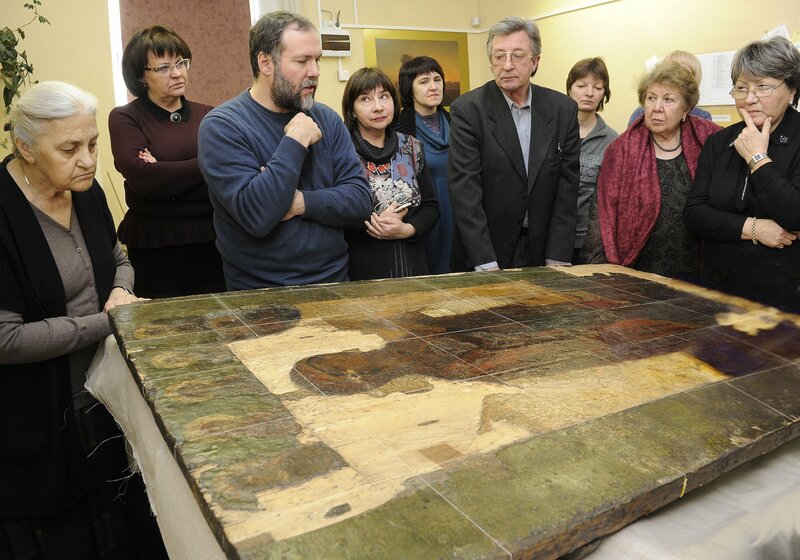 The Bogolyubskaya Icon was moved to the Vladimir-Suzdal Museum in Vladimir and a new program of restoration under Aleksandr Gormatyuk of the Grabar Art Conservation Centre began. Aided by the latest restoration technology — 3D scanning, CT scanning, scanning electron microscope examination, X-rays — Gormatyuk assessed the condition of the piece and traced the history writ on its paint. He identified no fewer than 20 interventions on the piece in its 858 years. The average for icons is 3 to 4 interventions. For six years Gormatyuk and his team worked to remove wax and resin layers and overpainting to reveal the original 12th century paint which by some miracle still survived. The Bogolyubskaya Icon now lives in a specially equipped restoration room with FUNCTIONING climate control systems. Only 12 people are allowed inside the room to eliminate human emissions and effluvia from the conservation equation as much as possible. The icon will be kept in the room and monitored for two more years at least. 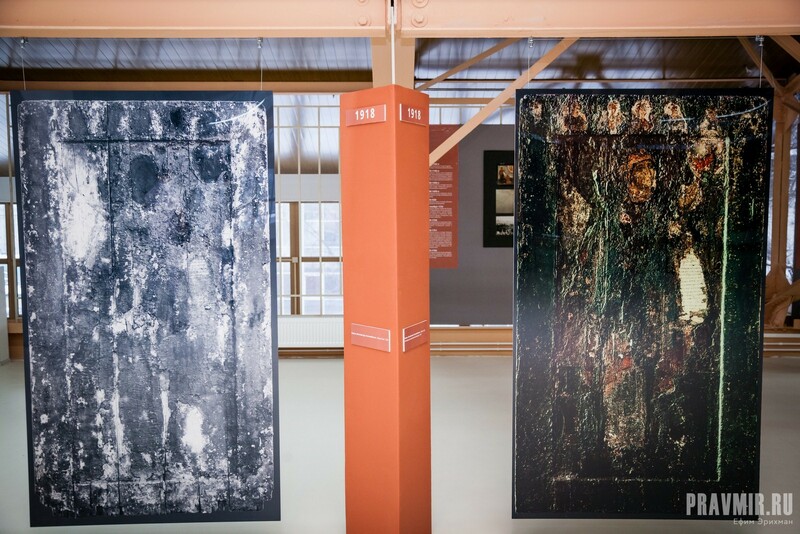 Since the icon is still far too fragile to travel, the Moscow exhibition uses life-sized photographs, orginal documents, weapons from the 12th century, white stone carvings from Vladimir to give visitors an understanding of the history of the Bogolyubskaya icon and its restoration. Friday, February 26th, is the last day of the exhibition, so if you’re in Moscow there is no time to waste. 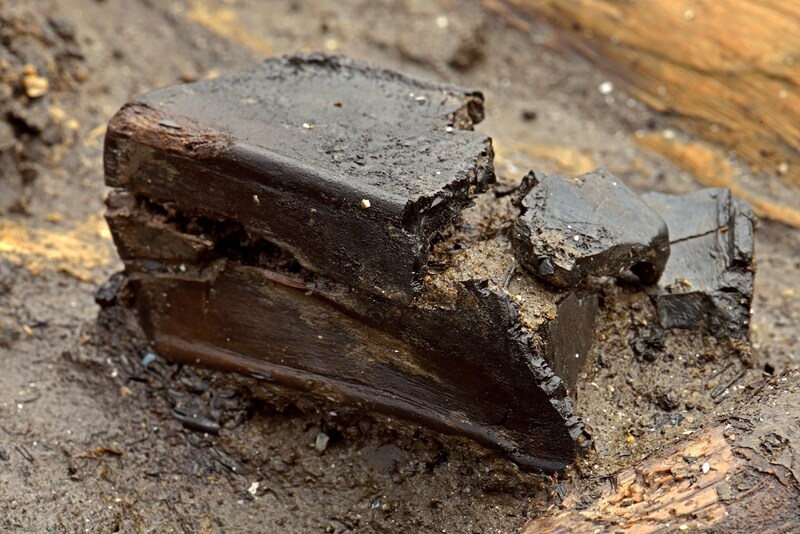 The Must Farm excavation has unearthed yet another unprecedented archaeological treasure: a Bronze Age wooden wheel so complete even a stump of its axle survives. It dates to about 1,100-800 B.C. 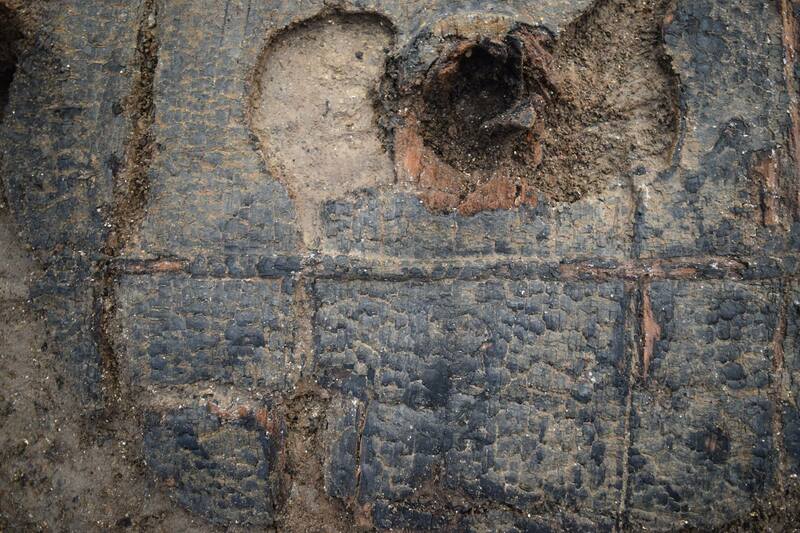 and is the earliest complete Bronze Age wheel found in Britain. A wheel from around 1,300 B.C. 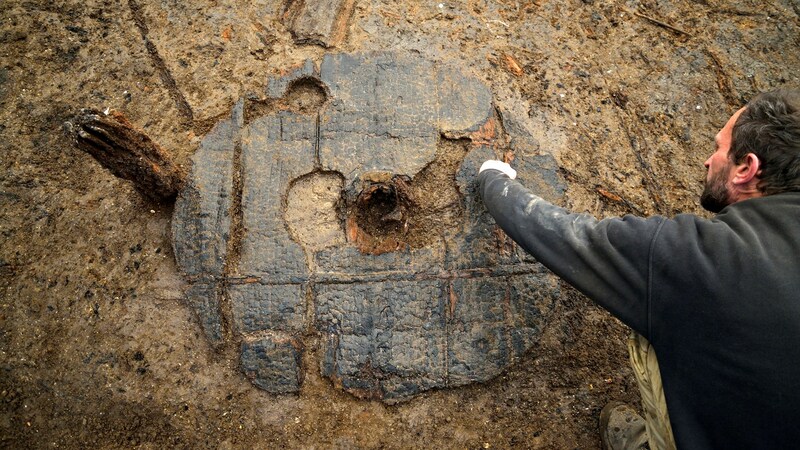 discovered at the Flag Fen site two miles away in the 1990s is the oldest in Britain and Copper Age wheels from around 2,500 B.C. have been found in continental Europe. The Must Farm wheel is one meter (3.3 feet) in diameter and about 3.5 cm (1.4 inches) thick which makes it the largest discovered in Britain. The Flag Fen wheel is incomplete — it’s a crescent with the center missing — and .8 meters in diameter. The wheel was made of three wooden boards held together by two horizontal bracers that are secured with dovetail joints. The radial structure of the hub identifies it as oak and those half-moon dugouts on either side of it were probably decorative elements that also had the practical side effect of decreasing the weight of the wheel which would be especially important in a watery environment. The less weight on the wheel the less likelihood of sinking incidents. There’s charring on the surface of the wheel, but it’s radiant charring which means it wasn’t actually on fire but rather near it. It’s very similar in design to the Flag Fen wheel, so there’s no question that it’s a wheel, not a shield or tray or any other round, flattish wooden object. The Flag Fen wheel is also tripartite and also held together by horizontal bracers. It was made of three different kinds of wood: alder for the outer rim, oak for the axle and braces and ash for the dowels. We already know the Must Farm axle was also oak. Further analysis of the wheel will determine whether it too was made of more than one kind of wood. Mark Knight site director of the excavation, said the discovery of the wheel helped create a much more detailed picture of the way those families lived in 1100-800 BC. “This was a settlement built on a river that exploited dry land,” he said. 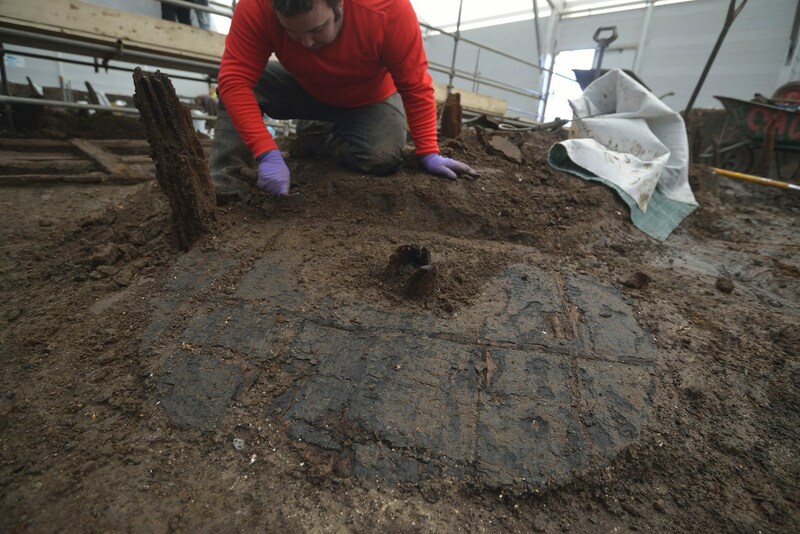 The wheel was found nestled in sediments a few yards from the largest round house. The spine of what is believed to be a horse was found in January in the same area. He may have pulled the chariot or cart this wheel was once attached to. It’s too early to say for sure what its use was. While it’s in unprecedented shape for its age, the wheel is in delicate condition. 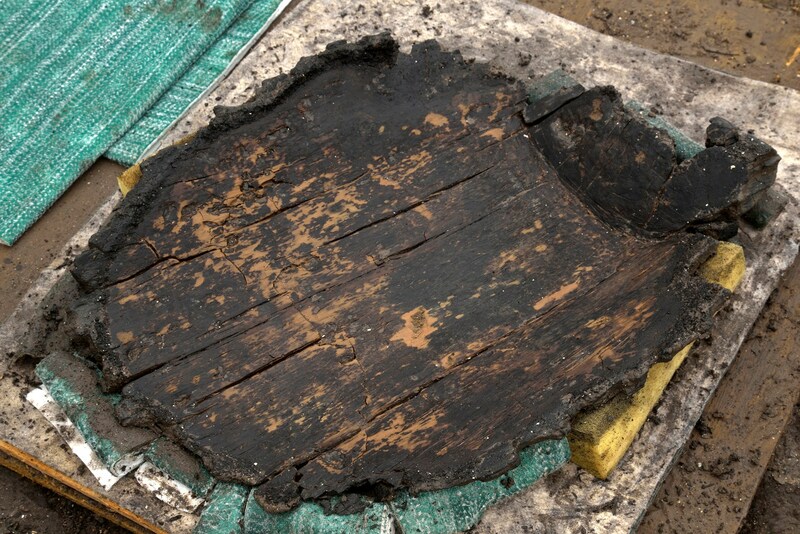 The area where it was found is not as well preserved as the rest of the site and the wood is beginning to flake. It will be removed in its entirety and conserved in laboratory conditions. 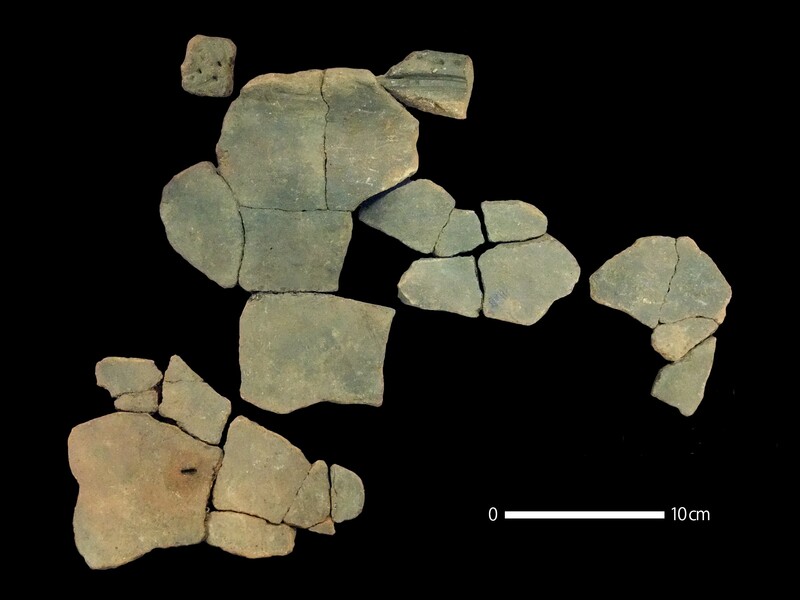 Archaeologists found other wooden artifacts in the same spot: a wooden platter, a wooden box, small bowls with food remains still inside (nettle stew again, Mom? ), tools and textiles. The exterior surface of pottery can be a surprisingly rich source of information about ancient flora and fauna. Dents and holes that were once assumed to be insignificant have in the last 25 years been discovered to be impressions left by seeds, nuts or insects. In ancient Japan, for instance, sometimes soybeans and adzuki beans were used in the production of pottery. By examining the cavities they left behind, archaeologists were able to narrow down when cultivation of these staples began in the area. Using X-ray and CT imaging and scanning electron microscopy (SEM), the team of Professor Hiroki Obata at Kumamoto University examined potsherds discovered in the Odake shell mound in Toyama Prefecture which dates to the early Jomon Period of Japan (5,300 – 3,500 B.C.). They found more than 500 Egoma seed cavities on the surface. The team then examined potsherds from the Motonobaru archeological site which dates to the late Jomon Period (2,500 – 1,300 B.C.). They made a silicon replica of the surface which they scanned with a scanning electron microscope. This “impression replica” system allows researchers to examine the original surface in greater detail. This time they found the imprints of cockroach egg cases. The cases were 11 mm long and were characteristic of the smokybrown cockroach (Periplaneta fuliginosa) which is from southern China. Historical sources — literary references and artistic depictions — record the presence of the smokybrown cockroach in Japan during the 18th century, but earlier references were thought to be domestic roaches. Since the pottery fragments are 4,000 and 4,300 years old, they indicate smokybrown cockroaches reaches Japan at least 3,700 years before they appear in the historical record. Pottery fragments from Motonobaru analyzed last year found 173 impressions of the maize weevil. That’s half the total number of ancient maize weevils ever found in Japan. Two hoards of Iron Age and Roman coins and jewelry discovered in 2012 and 2014 have gone on display for the first time at the Museum of Liverpool. The Museum of Liverpool and the Congleton Museum secured a £65,400 ($93,400) grant from the Heritage Lottery Fund to acquire both hoards and create an exhibition that can tour the area. That exhibition is now up and running and will be shared between the institutions. It moves to the Congleton Museum in July. 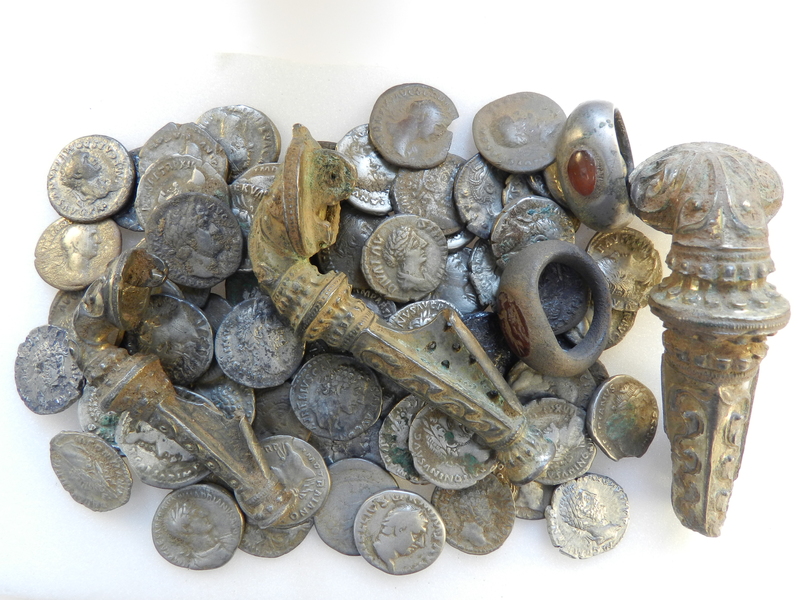 The Malpas Hoard was discovered at a metal detecting rally on January 9th, 2014, near Malpas, Cheshire. It’s a group of 35 coins, seven Iron Age British gold coins and 28 early Roman coins. 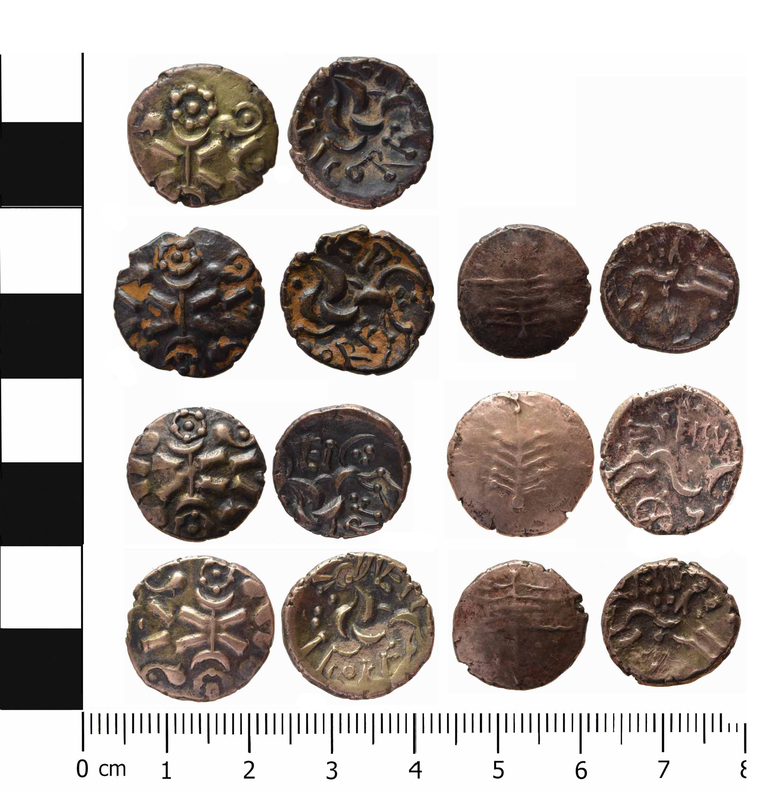 The British coins are gold staters struck between 20 and 50 A.D., three of them of the western regional series inscribed “EISV” and four of the northeastern series inscribed “VEP CORF.” This is remarkable because western coins circulated in Gloucestershire and surrounding counties where the Dobunni tribe lived, significantly to the south of Malpas, while northeastern coins circulated in Corieltavi territory of Lincolnshire and Leicestershire, significantly to the east of Malpas. Individual coins in the series have been found in the northwest, but this is the first hoard. It’s also very unusual to find a split of regions in a single hoard. The Roman coins are silver denarii, most of them from the Republican period. The earliest was struck in 134 B.C. by the moneyer Augurinus in Rome. The most recent were struck in the reign of Tiberius Caesar (14-37 A.D.). This group is typical of the kind of money introduced to Britain from the time of the Roman conquest in 43 A.D. Experts believe the hoard was buried shortly thereafter, in the 40s or 50s A.D., because the Tiberius coins are in very good condition and show few signs of wear so they can’t have been in circulation long. 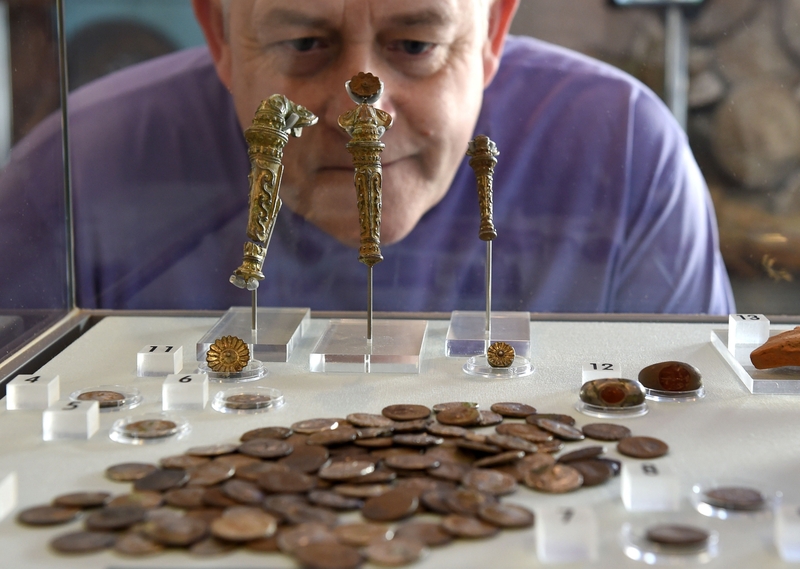 The Knutsford Hoard was first discovered by a metal detectorist Alan Bates in May of 2012. 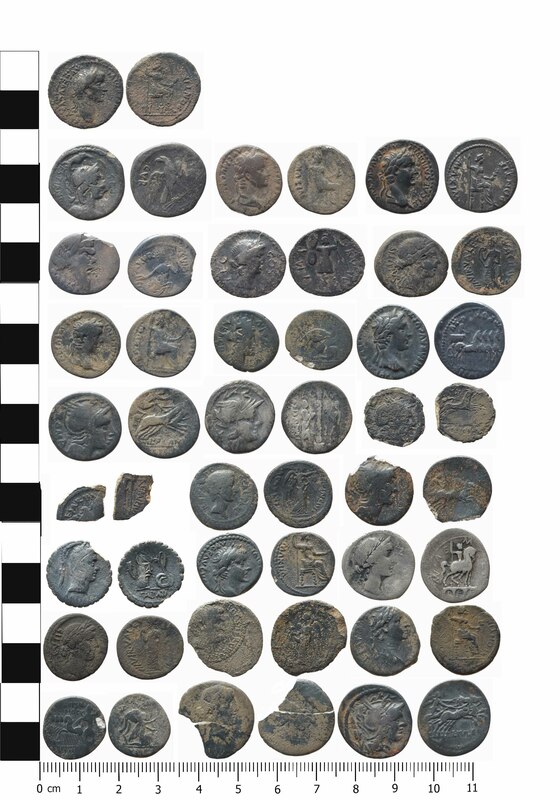 He and archaeologists from the National Museums Liverpool and Cheshire Archaeological Advisory Service returned to the find site in June and removed a soil block containing many more coins for excavation in the lab. The final tally is 101 silver denarii, two sestertii, three gilded silver trumpet brooches and two silver finger rings. There was also a group of pottery fragments, including 21 from an orange-ware vessel. The earliest coin is a denarius issued by Mark Antony around 32-31 B.C. ; the latest a denarius from the reign of Commodus dating to 190-191 A.D. That suggest the hoard was buried in the late second century. 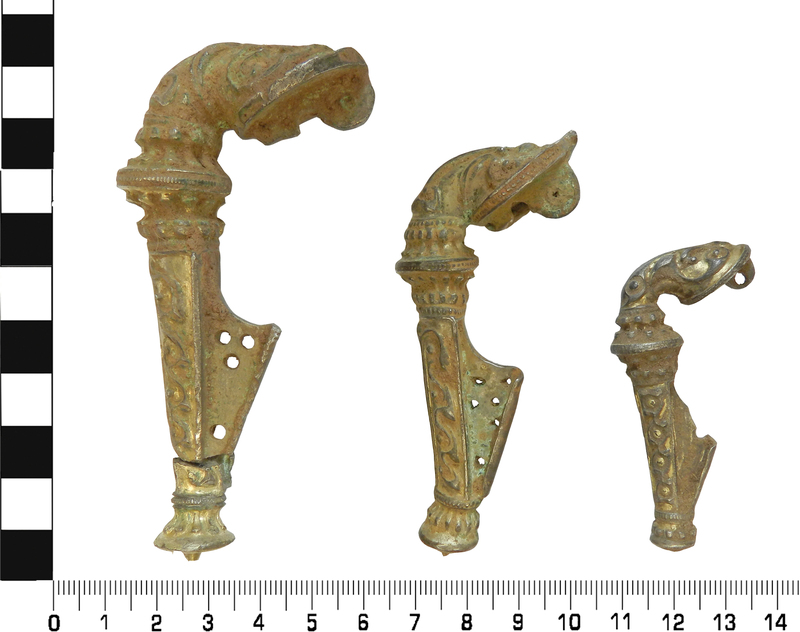 Trumpet brooches, so named because their open ends and tubes look like trumpets, were a popular style in the 2nd century and appear to be associated with the Roman army. These are heavy, expensive examples, made in a mould and decorated with British-style scrolls and curvilinear designs. They are parcel-gilt: the background of the scrollwork is gilded while the scrolls themselves are left in silver. The finger rings are silver with intaglio carnelian stones. One of the carnelians has been engraved with a winged figure, possibly Mercury or Victory, facing left with one arm raised. The carving on the other stone is no longer visible. It appears to have been file away. They’re very small, just 25 and 26 millimeters wife, so they may have been women’s jewelry. On the other hand, intaglio rings were often used to stamp wax seals which was more of a man’s game at the time, so it’s possibly they might have been intended for a man to wear on his pinky. Liz Stewart, curator of Archaeology and the Historic Environment at the Museum of Liverpool said: “These two hoards provide fascinating evidence about the wealth, trade, lifestyles and identities of people in the North West in the early Roman period. To celebrate the new exhibition, the Museum of Liverpool will host a conference on February 27th from 10:00 AM to 5:00 PM that will be open to the public and free of charge. Experts from all over the country will discuss the hoards, their historical context and what they can tell us about life in first and second century northwest England. Saturday, August 9th, 1856, Elizabeth Martha Brown was hanged in front of Dorchester Gaol. A month earlier she had killed her husband John with multiple hatchet blows to the head. The marriage, needless to say, had not been a happy one. She was a housekeeper, he a servant at Blackmanston Farm. She was said to be a handsome woman with a beautiful head of thick, curly hair, but she was 20 years older than her husband and it was generally thought that he married her for money. Her £50 savings allowed the couple to move to Birdsmoorgate in the Marshwood Vale and open a shop. Soon she suspected him of having an affair with a younger woman, Mary Davis, who ran a shop near theirs, and according to Martha, he became verbally and physically abusive towards her. One night he got home in the wee hours and by morning he was dead. At first she denied having murdered him. She claimed he’d been kicked in the head by a horse 200 yards away from the house and somehow made his way home where he expired. A doctor found that there was no way he could have walked home with the injuries he’d suffered. Martha stuck to her story but the jury at the Dorchester Crown Court were not persuaded and she was condemned to hang. It was widely believed that her insistence on sticking to her patently false cover story sealed her doom, that if she had confessed and repented, her life would have been spared. On top of the horse kick lie, her calm demeanor at the trial was interpreted as callousness. Just before she was executed, Martha Brown signed a full confession. “My husband, John Anthony Brown, deceased, came home on Sunday morning, the 6th of July, at two o’clock, in liquour, and was sick. He had no hat on. I asked him what he had done with his hat. He abused me, and said, ‘What is it to you, d–n you.’ He then asked for some cold tea. I said that I had none, but would make some warm. He replied, ‘Drink that yourself, and be d—d.’ I then said, ‘What makes you so cross? Have you been at Mary Davis’s?’ He then kicked out the bottom of the chair upon which I had been sitting. We continued quarrelling until about three o’clock, when he struck me a severe blow on the side of my head, which confused me so much that I was obliged to sit down. Supper was on the table, and he said, ‘Eat it yourself, and be d—d.’ At the same time he reached down from the mantelpiece a heavy horse-whip, with a plain end, and struck me across the shoulders with it three times. Each time I screamed out. I said, ‘If you strike me again I will cry, Murder.’ He retorted, ‘If you do, I will kick your brains out through the window.’ He also added, ‘I hope I shall find you dead in the morning.’ He then kicked me on the left side, which caused me much pain, and he immediately stooped down to untie his boots. I was much enraged, and in an ungovernable passion, on being so abused and struck, I directly seized a hatchet which was lying close to where I sat, and which I had been using to break coal with to keep up the fire and keep his summer warm, and with it (the hatchet) I struck him several violent blows on the head. I could not say how many. He fell at the first blow on his head, with his face towards the fireplace. He never spoke or moved afterwards. As soon as I had done it, I wished I had not, and would have given the world not to have done it. I had never struck him before, after all his ill treatment, but, when he hit me so hard at this time, I was almost out of my senses and hardly knew what I was doing. Martha Brown was the last woman to be publicly hanged in Dorset. Dorchester, which had a centuries-long history of exceptionally brutal public executions, hadn’t had a hanging in 26 years and people flocked to see this woman breathe her last. Close to 4,000 people filled North Square for the revival of what had once been called “hang fairs.” One of the spectators was a 16-year-old apprentice architect named Thomas Hardy. The hanging of Martha Brown made an indelible impression on the young man, so much so that 35 years later he would write a novel about a tragic heroine who staves in the head of the abuser who ruined her life and is hanged for it. 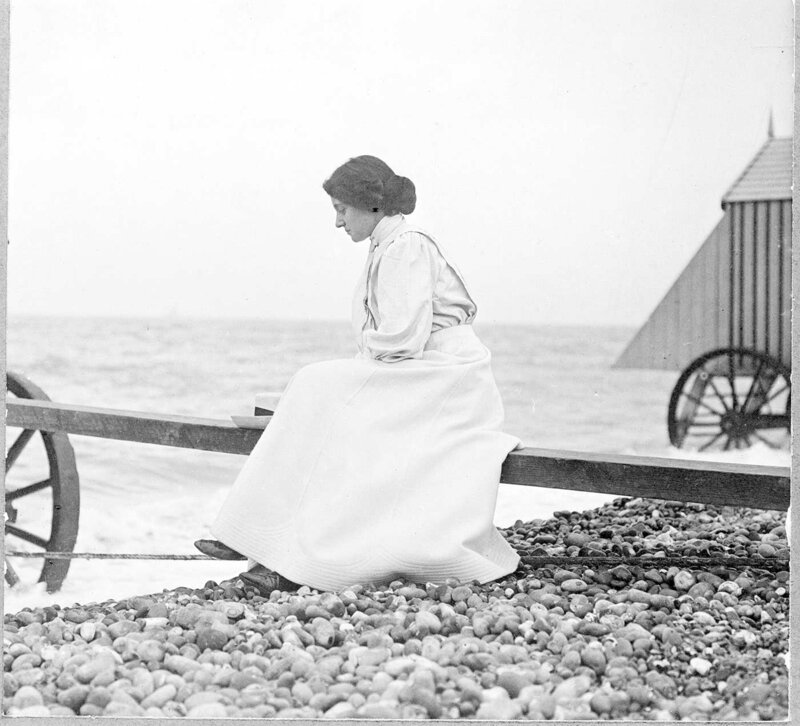 Writing Tess of the d’Urbervilles couldn’t exorcise the memory of Martha Brown. Seventy years later in 1925 Thomas Hardy found himself in Martha’s old stomping grounds when he visited the estate of Racedown in the Marshwood Vale where Wordsworth and Coleridge had once stayed. He asked Racedown’s owner, Lady Hester Pinney, to find out more about Martha Brown. In correspondence with Lady Hester he explained his personal connection to the case. “I am ashamed to say I saw her hanged, my only excuse being that I was but a youth and had to be in the town at that time for other reasons… I remember what a fine figure she showed against the sky as she hung in the misty rain, and how the tight black silk gown set off her shape as she wheeled half-round and back. 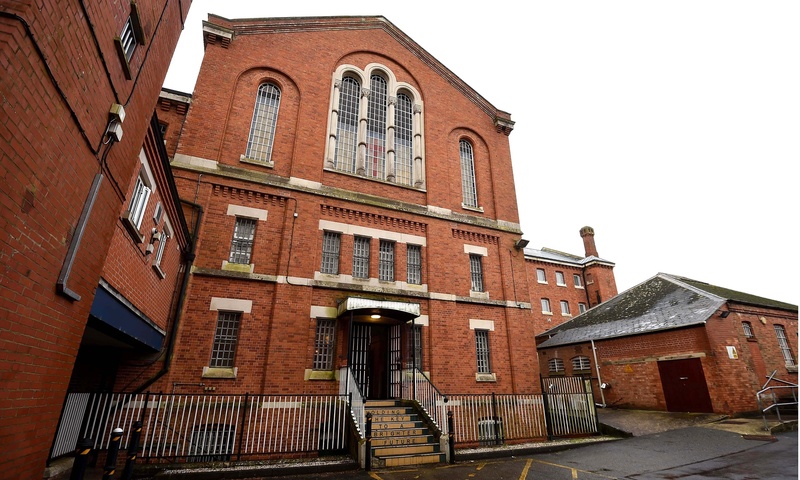 The Dorchester prison was closed in 2013 and developers plan to build homes on the site. An archaeological survey found human remains, not in the prison burial ground but outside consecrated ground. This was not unexpected. The dead of Dorchester Gaol were buried in a cemetery on the grounds and outside of it. 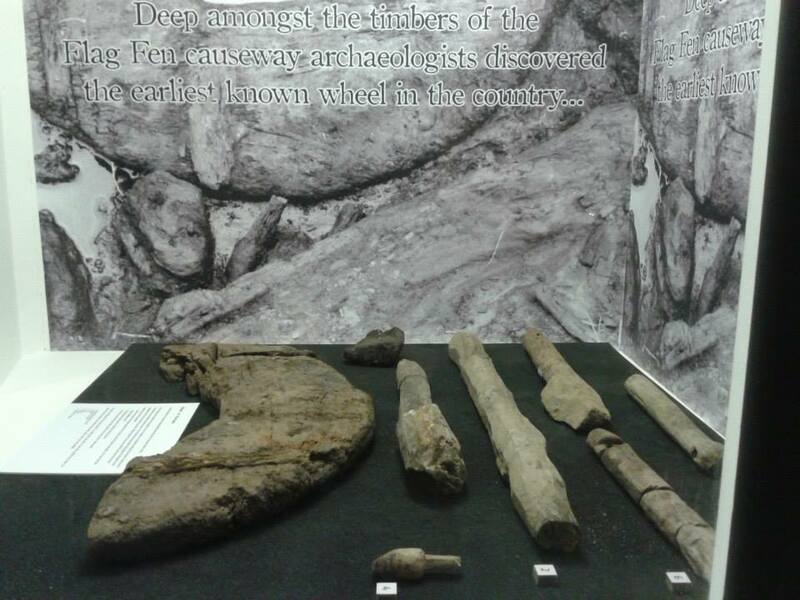 The remains were left in situ and any that will be disturbed by future construction will be removed and reburied. 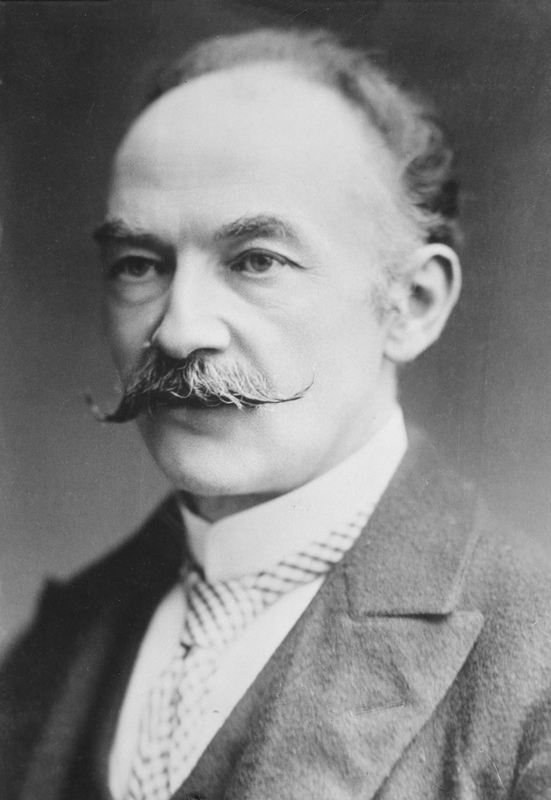 The thing is, one of those buried individuals may be Martha Brown, and there are a lot of Thomas Hardy fans who want this possibility explored.